Adobe develops a range of products for digital media creation and editing, multimedia authoring, and web development that help customers to create, deliver, and optimize compelling content and applications. Since the licenses for these tools are often too expensive and more than affordable for freelancers or owners of small businesses which have limited budget to procure the software. As the result, most resorts to piracy or crack to use the software illegally. Beginning from Adobe CS5.5, Adobe is offering monthly or yearly subscription of most Adobe software products. The subscription editions of Creative Suite software are exactly identical with regular Creative Suite products, where they are installed on your computer and provide all the same full features and functionality. With this offer, users only need to pay a fixed monthly fee and able to manage subscription plan easily, such as to stop and start subscription as and when needed. However, to subscribe this offer from Adobe requires users to create or sign into Adobe account. Interested users can choose a one-year plan for lower payments or a flexible monthly plan. 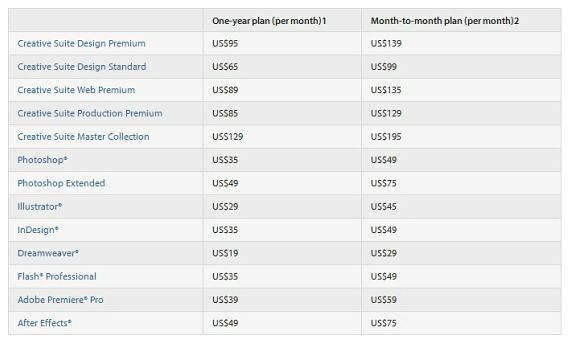 The one-year plan offer lower monthly payments and requires a one-year commitment, while monthly plan provides the flexibility of a short-term commitment which users can stop and restart subscription as needed. Unfortunately, some of the Adobe products such as Adobe Captivate, Lightroom, and Adobe Audition are not available through subscription. To buying subscription, users need to choose the subscription option and plan from Adobe.com. Once finish, users can simply download the software and begin using it. The credit card will be charged monthly regarding plan you choose. Note: For more details can check out the subscriptions page on Adobe.com. In addition, these subscription services are only available through Adobe.com and countries where Adobe has an online store. Users can use the store selector to search whether Adobe has a store in your country.